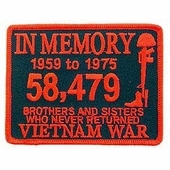 Our In Memory Vietnam patch is a full color, embroidered military patch. This is the same patch that is supplied to the Military and sold in Military Base Exchanges. This patch would be a great gift idea and a wonderful addition to your patch collection.